Brian at the helm on our way back to Black Rock Harbor, haze/mist coming ahead of the predicted thunderstorms. Sometimes you just have to go out an enjoy a windy day when you are planning on cruising. Today was the day for just that. We met up with a friend at the yacht club who was free for the afternoon, so off we went. 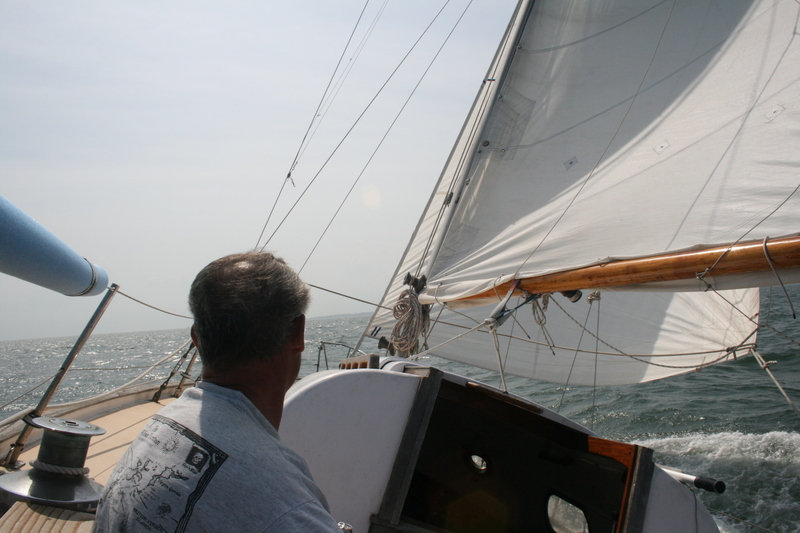 It was a picture perfect day for sailing on Long Island Sound, bright blue skies, sustained winds from the south at 17 knots with a few gusts to 24 knots. 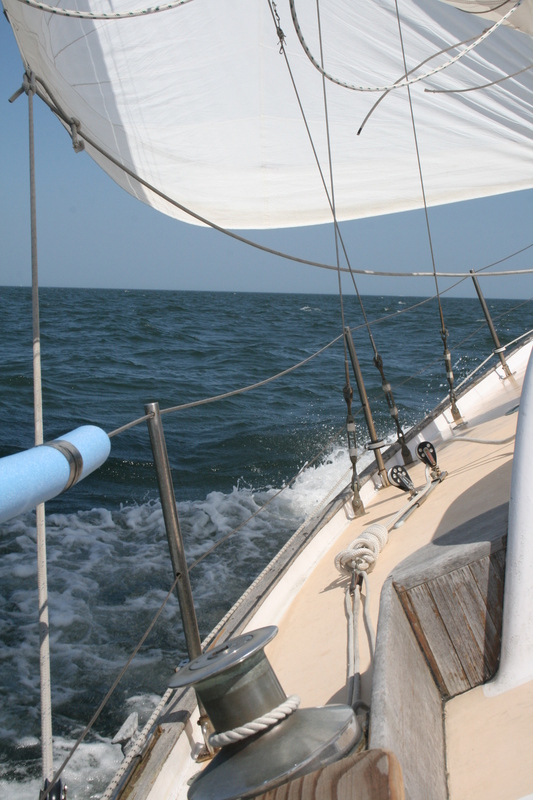 Brian put 2 reefs in the mainsail, put the sail up at the mooring, dropped the lines and off we went. Surprisingly, there were not many boats out, but enough to enjoy the scenery. Again, it was good practice to use the newly installed tiller. And again, it was a good day to realize that without the wheel post in place, the short person (me) has very little hand holds in the cockpit. I was creative, but if the winds were any greater, I would have been sitting on the cockpit deck instead of the lockers! The end result of today: a great sail, bright sunshine, good conversation with a friend we haven’t seen in a few months, and yes, the toe-rail was in the water. With a wet toe-rail there is usually a smile on Brian’s face because the winds were meant to allow Scout to perform to her fullest! Now if we only didn’t have to work all week, we could enjoy a great week on the boat. Let’s hope the weather holds for Wednesday race night, gives us cruisers a chance to sail during sunset and still get the launch set up for the racers. Hope everyone this weekend had a chance to do what ever makes their heart sing.